I'm in trouble! My heart sings with utter joy and skips a few beats when I get to play with some stones. 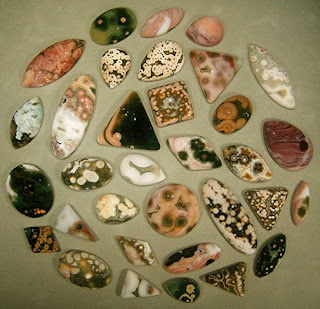 And boy, I can't wait to pick up some new stones ( especially Ocean Jasper ) when the Mr. and I get to Germany next month. I put in a HUGE order and am also thinking about selling some of my stones in my supply shop. Oh I just can't wait to go to some cool jewelry supply shops, get myself some new tools and tons of stones....*sigh*. I am working on a couple collections that are still in the sketching stages, involving pearls and organic sterling silver "woodsy" type pieces. I think it will be a nice collection, just in time for the holiday season. I think the trip to Germany will bring upon newfound inspiration in many ways. The Mr. and I really need some downtime. We both have been working hard this past year and can not wait to start driving, taking some pictures, putting up a tent along the coast in Sweden and listening to the waves crash in. Nevertheless it will be a fun trip. My Etsy shop has been really slow in the past month or so. I don't think it's a good idea to keep on posting new items all the time if they are not selling right now. I am hoping things will pick up again after the summer. I am really glad to have a steady customer base here though. That keeps me busy throughout the year. I've had a long day. Been up since 6 am and it is now 10:30 pm. Need to get some sleep which is not easy with the midnight sun in its full glory. However, it is quite spectacular to be able to sit outside past midnight with the sun shining brightly. Today we had 24 degress celsius!! Gorgeous day! Life is just great! Sometimes I really need to pinch myself. Wow! So many gorgeous stones in the photo above. The trip you're going to take sounds wonderful! Curious about the design your man sketched for you, I clicked, and found the same *ringlet* shaped design MY guy gave me for an idea not long ago ~ funny!